Whilst it could be said that the recording sessions for what was The Move's final studio album "Message From The Country" and ELO's first two outings's "The Electric Light Orchestra" and "ELO2" were somewhat interchangeable, there is one Jeff Lynne penned song - recorded by both The Move and ELO - that has led a double - even triple life in more ways than one. 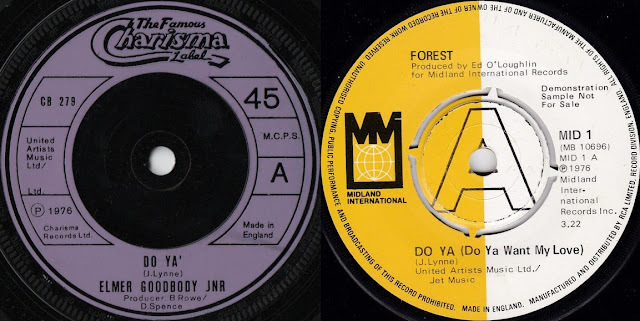 Originally released in the UK as part of a twin 'B' side with "Ella James" on the flip side of The Move's final hit single "California Man" (Harvest #HAR5050) and as the sole 'B' side for the same song in the US (United Artists #50928), the trademark guitar riff of "Do Ya" helped The Move breach the Billboard 100 at #93. 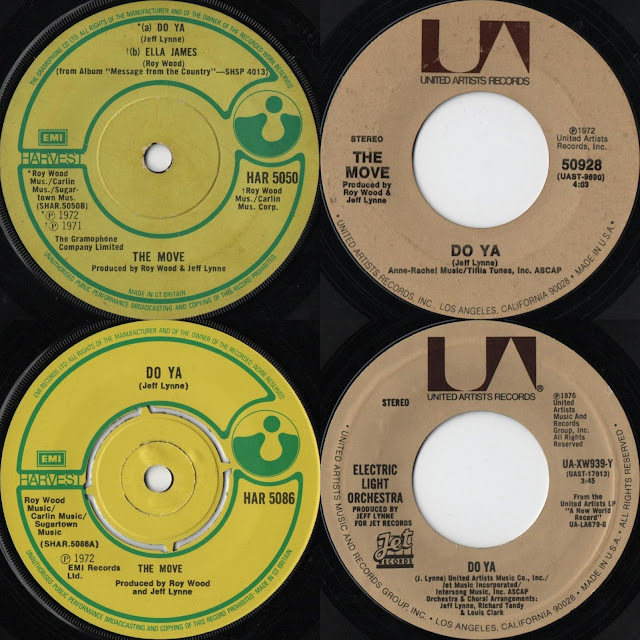 Back in their home country, "Do Ya" eventually saw a limited release in September 1974 as an 'A' side backed by "No Time" (Harvest #HAR5086). A bizarre issue in many ways as ELO had departed Harvest Records for Warner Bros. Burbank label a year earlier. Two years later, "Do Ya" was given the ELO treatment by Jeff, Richard Tandy and Louis Clark as part of their iconic worldwide breakthrough album "A New World Record" in 1976. A live fave already, the inclusion of "Do Ya" on ANWR cemented it in ELO folklore. It's popularity also attracted cover versions by Elmer Goodbody Jnr. (who was none other than Mike Sheridan) and Forest in the same year. Whilst it was not a single here in the UK, over in the US, "Do Ya" b/w "Nightrider" (Jet/UA #UAXW-939-Y) managed a creditable #24. "Do Ya" was, of course, again re-recorded by Jeff Lynne in 2012, forming part of "Mr. Blue Sky: The Very Best Of Electric Light Orchestra". It also made a welcome return to the Jeff Lynne's ELO set list during their recent UK dates at Sheffield and Wembley Stadium. Aside from the aforementioned 1976 covers, "Do Ya" continues to be recorded and performed by not a few artistes down the years including Matthew Sweet, Parthenon Huxley (The Orchestra), Todd Rungdren, Jason Falkner (a major contributor to the forthcoming new Pugwash album) and Ace Frehley. It was also the subject of a clear vinyl EP back in 2002 (see above) via Tallboy Records featuring four versions of the song by Kenny Howes and The Yeah!, Einstein's Sister, Linus Of Hollywood and Parallax Project. So whether it be The Move, ELO or a solo Jeff Lynne, "Do Ya" remains the one song that ensures a common thread for fans all the way from its conception within The Move through to the present day and beyond to the many admiring artistes who still love this great song.